At the end of May over twenty Lewis and Clark themed kites were installed in seventeen locations throughout Salmon. 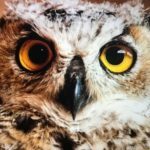 The kites came from Sky Wind World, Inc. in Billings, MT. Thanks to the Idaho Humanities Council, the Idaho Commission on the Arts, the Salmon Local Option Tax, and US Bank this exhibit was fully funded with grants. 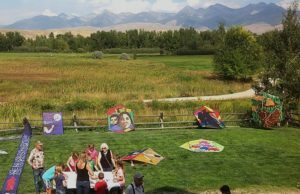 The kites remained on display through Labor Day and on September 7th we made a wish for wind and had a kite flying day. Unfortunately it turned out to be a beautiful, sunny, and completely windless day, but thanks to the Salmon Public Library’s Makers program there was kite building throughout the afternoon and over 150 people enjoyed seeing all the large kites on the lawn. VOLUNTEERS MAKE THE WORLD GO ‘ROUND! The Center hosted three onsite volunteers over the summer: Ken from Arizona, Mary from Illinois, and Linda from West Virginia. What amazing help they were with site maintenance, interpretation, and general operations, clocking a combine time of over 800 volunteer hours! And, a special thanks for cleaning up after the resident Great Horned Owl, who we loved having around, but who made a mess of the deck regularly. The annual Agaidika Gathering took place in August as usual, but this year it included the premier of a documentary film by Naka Productions (makers of The Spirit of Sacajawea, 2007). Their new film is called In Good Faith. 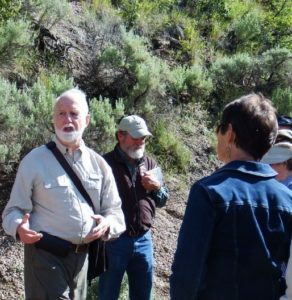 It follows the work of Dr. Orlen Svingen, and his Washington State University students, as they researched the history of the unratified 1868 Virginia City Treaty signed by Chief Tendoy. We are excited to let you know that the filmmakers have announced that PBS will be picking up the documentary and expect to see it on the air in late 2019. The Governor’s Lewis and Clark Trail Committee once again provided funding for special projects at the Sacajawea Center. The Center was able to work with Ramon Murillo, the Cultural Education instructor at Fort Hall Jr./Sr. 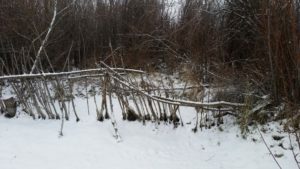 High School, as well as students from Fort Hall High School and Upper Carmen Public Charter High School to rebuild the replica fish weir and sweat lodge along the interpretive trail. Funds were also used to purchase new canvas tipis for the interpretive trail. 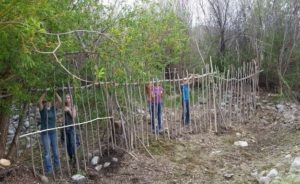 The Sacajawea Center hosted the Student Conservation Association’s Idaho Corps for a day of service in September. They helped clean up the community garden after a long summer season and removed and then rebuilt the jack fence around the north side of the Learning Center and it looks great! The Salmon Outdoor School had another successful year providing ancestral living skills programs onsite May through October. Programs this year included needle felting, willow basketry, leather work, and wood carving, just to name a few. We would not have such captivating classes without the expertise and commitment from our instructors, Joe and Denyce Bigley. The Bigley’s have been providing programs at the Sacajawea Center for over 15 years! Thanks for your dedication and for keeping our history alive. Each Outdoor School student sees your passion and we know it rubs off on them! Looking forward, the Center is excited to continue to provide opportunities for learning and exploration related to Sacajawea’s tribe, the Agaidika (Salmon Eater) Shoshone-Bannock, the Lewis and Clark Expedition, life on the frontier, and the natural world around us. If you have a cool idea, we would love to hear it. Thank you all for your continued support!